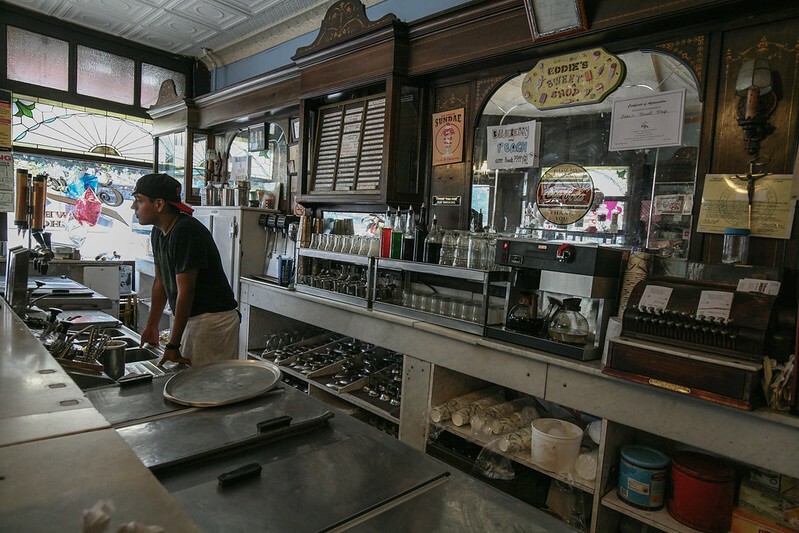 A couple of years ago, I was contacted by the owner of Eddie’s Sweet Shop in Queens, New York. He had seen my article on searching for tutti frutti ice cream, and wanted to let me know that his shop in Queens has been selling tutti frutti ice cream for decades. Last month, I was staying in Manhattan, and made the trip over to Queens to visit Eddie’s. Lo and behold, right there on the menu, and even spelled correctly, was tutti frutti ice cream. I ordered a cone of it, and tried to both relish the long-awaited experience, and analyze what exactly I was tasting. It seemed like a plain ice cream base; I did not detect any vanilla, so I presume just plain ice cream. There were bits of fruit; I would guess glacé fruit. The flavor of the fruit melded lightly with the flavor of the plain ice cream. The ice cream was pink in color; I do not believe that much pink color came from the fruit, so I suppose that some food coloring was added. And that’s about it. Tutti frutti, Italian for “all fruit”, seems to literally be ice cream with bits of fruit in it. I feel confident that I could make something at home with a consumer ice cream machine that would be similar. 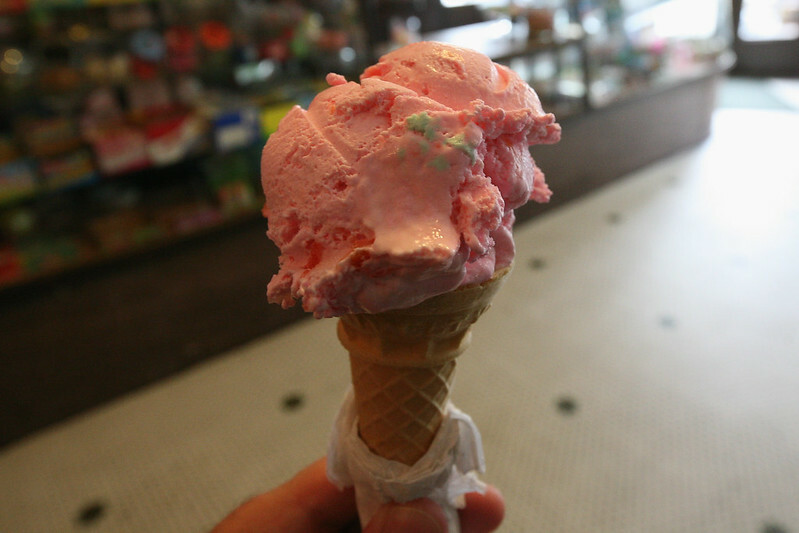 I know of at least two other shops in the United States which make tutti frutti ice cream. 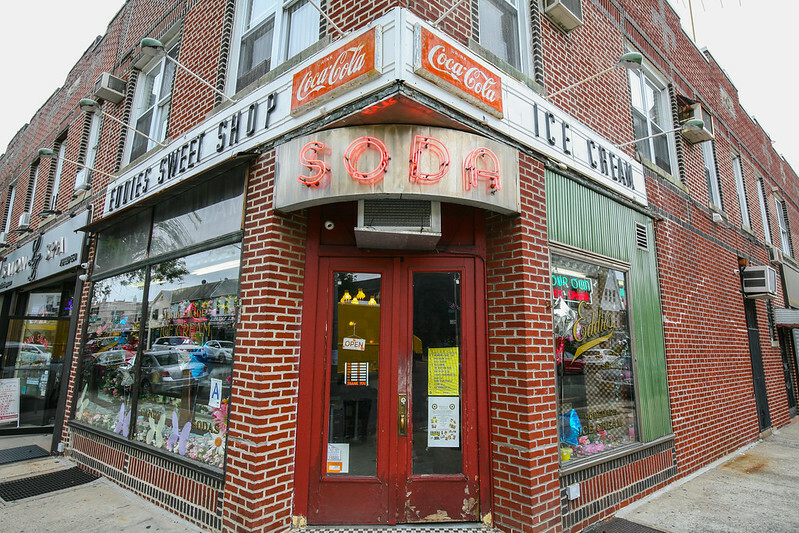 I hope to someday try their offerings as well, but given the history of Eddie’s Sweet Shop, I feel confident that this was authentic tutti frutti. If the other shops have something different called tutti frutti, then that may well be authentic also. In the 1990s I learned how to make web pages, and my first web page was to write up what I had learned searching for tutti frutti ice cream. My personal web page has taken on various forms since then, but I have always kept that content around, and added to it from time to time. I have corresponded with people across the planet, many either searching themselves, and some offering help on what they remembered tutti frutti ice cream to be like. I really don’t even like ice cream that much, and if I ate anything of the sort, which is infrequent, I’d prefer something like a turtle sundae with frozen custard, or maybe frozen yogurt with bits of chocolate candy. But thanks to Eddie’s Sweet Shop, my search for tutti frutti ice cream has come to a successful close. It is good ice cream. Should I visit Queens again, I would certainly want to go back for another cone. And maybe try another flavor too.